Tricky, she dreams about the dead birds. Sometimes I wake up very early to wake up the birds. I go outside and meander across the lonely streets. I pass the closed curtains of all our neighbors. I smell the scent of fish. I watch the fainting night. We have a little park nearby our house and I walk there. I walk there to enter the swamps of the Dutch morning murkiness. In the park I start to whistle like a bird. A little later, at least one bird awakes and answers me. I whistle back. We whistle back and forth. In a little while more birds whistle back and forth. Soon the swamp is filled with an orchestra of twiddles, and I’m a part of it. My heart fills with huge contentment if I do this. 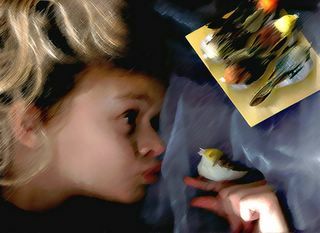 The idea I wake up the birds earlier than they wanted to wake up, gives me the feeling I make a difference to this world. I cannot figure out why it gives me the feeling I make a difference to this world by waking up birds, but I started this happening when I was eight years old.